A week or so ago, I had dinner with a friend at Fishtag, a Michael Psilakis restaurant. This was the former home of Kefi’s original location (also owned by Chef Michael Psilakis). The difference between that restaurant and Fishtag was the more airier space, making me feel a bit calmer and it’s a merge of Psilakis’ concept of robust, approachable Mediterranean cuisine and Fishtag has both seafood and his style of food. 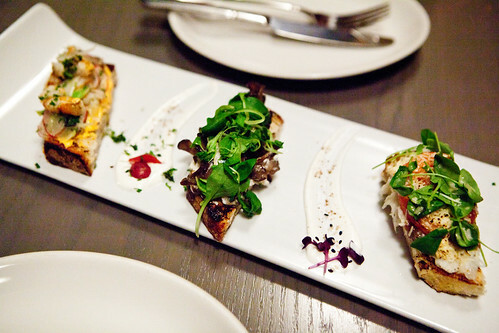 Executive Chef Stan Matusevich and his team executes this vision pretty well. 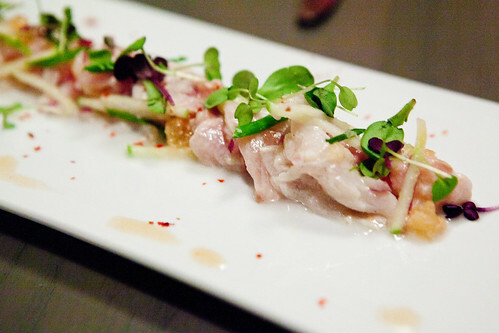 We started with striped bass ceviche ($12) composed of pristine, silky, citrus marinated striped bass with little bits of crisp, tart green apple, grapefruit and red onion were a sublime, delicate combination. The assorted bruschettas had the bacala & skordalia brandade “melt”, grilled prawn, feta & spicy chilies bruschetta, and maitake mushrooms & white anchovies bruschetta. For those who like creamy, mild flavors, the bacala & skordalia is your best choice. Our favorite was surprisingly the maitake mushrooms and white anchovies as it packed a ton of flavor (and no, the anchovy is not fishy); the grilled prawn, feta & spicy chilies was a close second favorite. The Tuscan kale and smoked trout salad ($11) was a tasty, hearty salad that could be a light meal in itself. 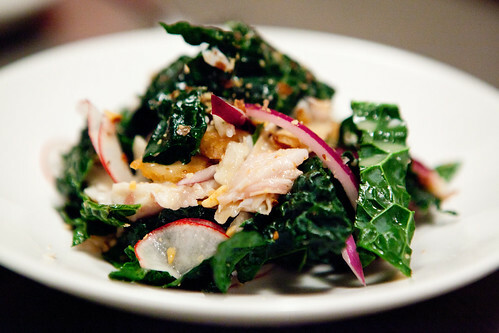 The bites of raw red onion bridged the flavors of the smoky, flaked trout and the kale. 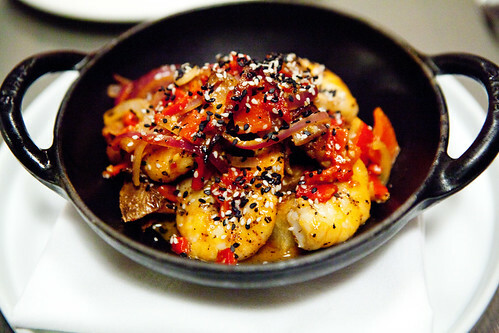 The Catalan shrimp ($12) made with patatas bravas, garlic, and zatar was a nod to Spain with very classic, tradition flavors. We really enjoyed this dish, as the shrimp were very large and perfectly juicy and the tomato-based sauce was balanced between mildly spicy and tangy. The potato wedges were crispy on the outside and wonderfully fluffy inside. 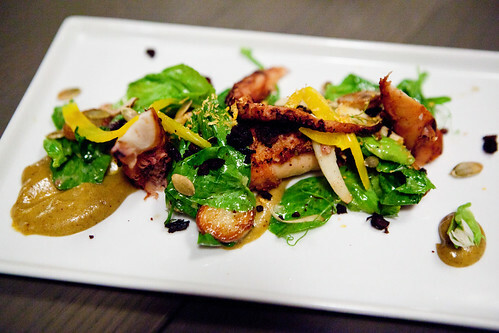 The smoked octopus ($13) with halved, beautifully crisp new potatoes, hearts of palm, snow pea leaves, crunchy pumpkin seeds, and a wonderfully vibrant date & green olive purée to enhance the flavor of the tender octopus. 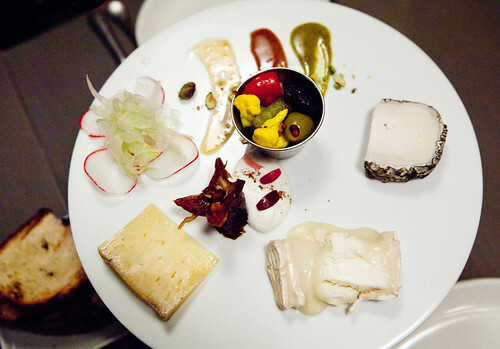 Despite the fact we’re pretty full at this point, we cannot say no to a smartly composed cheese plate of Pecorino Oro Antico($6.75), Casatica ($7), and Monte Enebro ($5.75) with condiments of spiced yogurt, pistachio butter, spiced honey, shaved fennel and radish. It ranges between goat and sheep’s milk cheese and I adored each cheese’s individual characteristics. One was stinky, creamy, and wonderfully funky (the Monte Enebro); the Casatica was naturally gooey that it’s hard not to spread it on their thick, smoky slices of rustic bread. The mildest one that my friend liked the most was the pecorino, but it was still delicious. 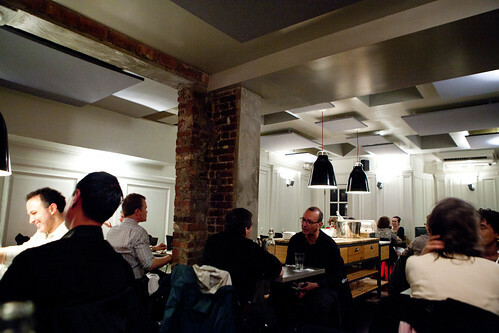 Fishtag is a very good destination for those who want solid Mediterranean seafood focused dishes in the Upper West Side. The dishes are generally balanced and flavorful and this place also have a spacious bar for those who want to drop in for a drink and a few plates of food at reasonable prices.